Benzoyl Peroxide is an important ingredient in acne treatment for cleansing skin from dirt, oils and dead skin cells. It has been known to regulate the oil production in the skin created by sebum. Benzoyl Peroxide helps to reduce blackheads as well as whiteheads, pimples and acne breakouts that can lead to acne scarring and cysts. 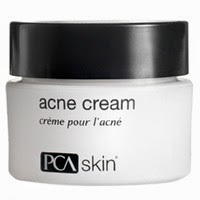 PCA Skin Acne Cream - $22, 15% OF.